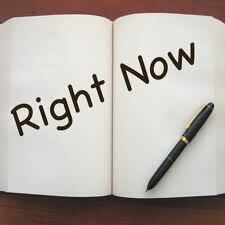 What do we write…Right Now! “The beauty of the moment”, “the music of now”… these are expressions that gently remind us to stop worrying about the past, to stop anticipating the future. The past is over. We can do nothing about it. We must move on. The things we worry about in the future exist only in our mind. They have not happened. Our fear portrays them as reality, when, in reality, they do not exist. God IS. He speaks to us in the now. He loves us in the now. “Therefore I say to you, be not solicitous for your life, what you shall eat, nor for your body, what you shall put on…Behold the birds of the air, for they sow not, neither do they reap, nor gather into barns: and your heavenly Father feeds them. Are not you of much more value than they?” (Matt, 5:25-26) Christ tells us again and again how much God loves us. But, for some reason, we find it difficult to grasp. We believe it, but we don’t trust it. We say to ourselves, “Yes, God does love me. But I am not a fool, I need to do this, or do that.” No, we don’t. What we need to do is trust an all-loving God. We have to realize that if He created us, had us in His mind, you and me, from all eternity, then this all-loving God will not abandon us. Brennan Manning, in his book, “Ruthless Trust: The Ragamuffin’s Path to God” states, “But faith in God without hope in his promises is tainted trust.” You can spend the rest of your life focusing on that one sentence. His premise is that mankind does not really trust God. To accomplish that trust… we must be ruthless in our pursuit of it. To worry about the past, the future, even about the condition of our spiritual life is to rob us of the here and now. It is in this moment that we honor and praise and love God. In the next one, too, and the one after that. How difficult this is. So much is stealing our attention, is forcing us to think of what was done yesterday, and what we have to do tomorrow. Right now…if you are meant to be reading this, then focus on what is being said. “What happens after this”, I don’t know. It is YOUR moment. How do we implement this moment to moment living? It just means that the next person you meet is to be treated, no… is to be acknowledged that he/she is the most important person in your life, right then. He/she requires and expects your full attention and concern. But, what if he is dirty? What if he is white, black, red, brown? What if he doesn’t meet my expectations? Jesus is in him or her; does He meet your expectations? What if it isn’t a person, I meet? What if something happens which I don’t like, I don’t want? How do I see the beauty of the moment, there? Ask God, “What do you want me to learn from this?” Each moment is given us, by a loving God. IT IS YOUR MOMENT!